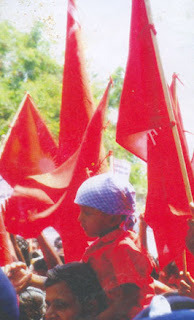 With this understanding, People's and Literary Association (PALA) and its associate organisations namely New Democratic Labour Front (NDLF), Peasants Liberation Front (PLF) and Revolutionary Students Youth Front (RSYF) in Tamilnadu set specific political agenda for every May Day to organise the working class to make conscious of its duty. 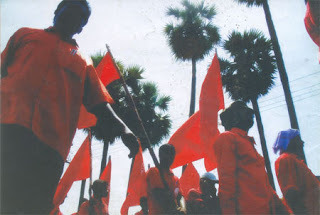 Hence, for the past two decades, May Day in Tamilnadu is marked with arousing protests, agitations and conferences by PALA. This year, as announced earlier, as part of the one month campaign against Reliance and MNC's entering in Retail sector, PALA organised the protests encircling Reliance Fresh Shops. The one month campaign had 1,50,000 pamphlets, thousands of posters and wall writings and 25,000 booklets covering all over Tamilnadu but the primary focus was on Chennai as at present Reliance has started shops only in Chennai. 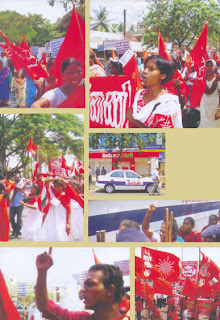 The intensive campaign involved the doorstep propaganda in and around areas of Reliance shops. The shop was closed expecting the protest and the police were all ready with barricades. Comrade Marudhaiyan, Secretary of PALA and Comrade Kaliappan, Joint-Secretary of PALA gave speeches explaining the movement. 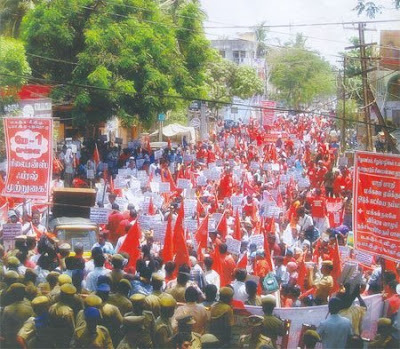 As the one-month campaign in various forms already reached the people of that area, they came in large numbers to watch the agitation bearing the three-hour traffic jam. The comrades got arrested 50 yards before the shop. When they all were carried in Police vans, Koyambedu trader's union designators came to wish the comrades. Comrade.Marudhiyan thanked them and said, "The distance between us and the shop is just 50 yards. But the distance between the understandings of the people on the menace of MNC's in retail sector and the reality is far more. Our motto at present of this struggle is to reduce that gap. If reliance to be put down, then Koyambedu should rise up!" The false and confused ideas ruling the minds of people that deter them to foray were not formed by Ambani. These ideas were thrust in by the ruling class, media and political parties with the implementation of Recolonisation from the last decade. When the traders alone raise the slogan to oust the MNC's, Reliance masquerades in 'quality and cheaper prices' and lures the people. But when the fight begins as a fight against Recolonisation then the slogan will become a people's slogan and the definite moment will arrive. The recent, spontaneous, laudable struggle of Ranchi vendors shows the desperation of the small vendor class. The land of Birsa Munda atlast showed the way to the country. These struggles should be organised and shouldn't be allowed to be corrupted with decomposed political parties. People's movements should be channelised as movements against Recolonisation as a whole and not to fade away as scattered and spontaneous.